A special night of rare ghetto disco, funk and african boogie! 1st EVER performance in Texas!!!!! The story of Kon begins in the record bins of Boston. Like the vinyl he collects, Kon is a rare breed. He consistently shakes up dance floors all the world over, and his popularity is so high that fans actually offer up their own dusty singles and LPs as a gift to this beloved collector. His working command of music history makes him a breathing tome of wax knowledge; to that effect, Shady Records, Dr. Dre, Pete Rock, Diamond D, and Capitol Records (to name but a few) have called upon his expertise. 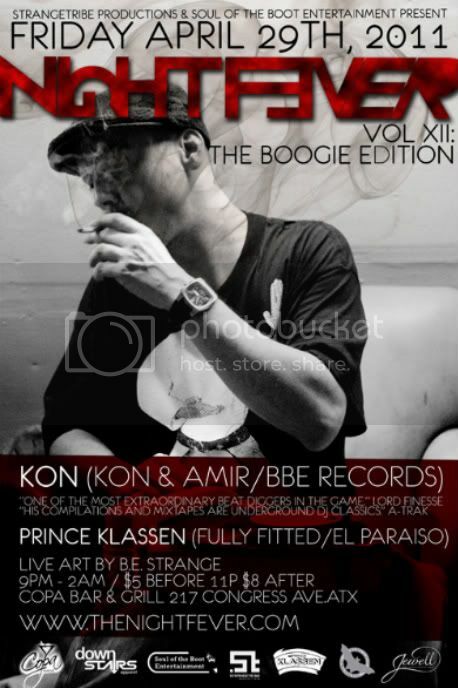 Kon has gained legendary status oversees while achieving domestic recognition from some of the most beloved beat-diggers, DJs, and producers in the game. Check this Live Mix on BBC Radio 1 for Gilles Peterson's Bday slammed full of brilliant re-edits! It's also my partner in life, Raina Gradford's bday at the strike of midnight! This one's for you mama!